The Negroid Venus Head, in slightly fibrous green soapstone, has a surface which is polished and worn, especially the face. The base is polished and worn, which suggests that the object was already an isolated head in the Paleolithic. The piece measures 24 mm in height, 24.5 mm front to back and 15 mm maximum width, and is therefore relatively flat and has a protruding chignon of hair. The facial features are strikingly represented: there is a receding forehead with massive eyebrows and deep eye sockets. 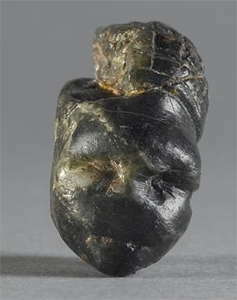 The nose is not present, it may be worn away, but most likely its depiction was prohibited by the shape of the piece of stone used. The cheekbones are strong, and the mouth is rendered by two small horizontal incisions aligned at the bottom of a depression, limited by a weak but clearly marked chin. The coiffure, largely destroyed, is represented by a grid reminiscent of the Venus of Brassempouy and that of the Femme à la tête quadrillée, from Laussel. The coiffure is represented by a series of incisions starting at the forehead, over the bun or chignon and back down onto the neck, cut by transverse incisions, the first of which form a kind of band above the forehead. 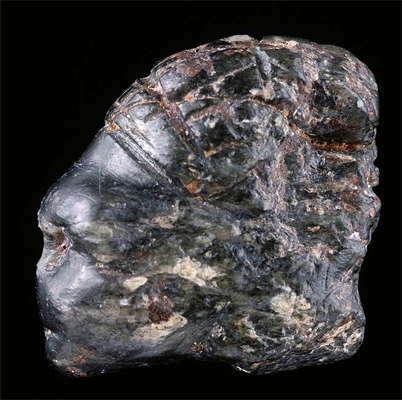 As for the Dame de Brassempouy, Piette has sought rapprochement with the hair of Egyptian pharaohs and tried to make this head evidence for the existence of a Grimaldi Negroid population. A Woman with negroid features, made of soapstone. 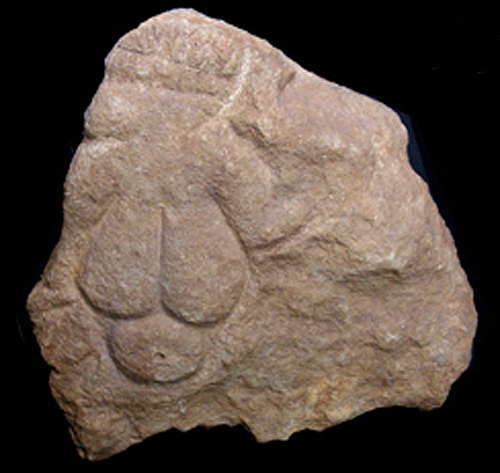 Age is probably Gravettian or Old Epigravettian, and it was found at la grotte du Prince. 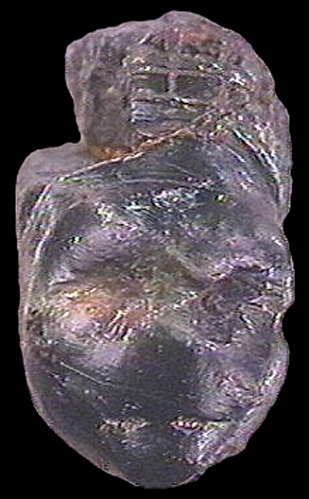 Woman with negroid features, made of soapstone. Note that nearly half of the coiffure has been broken off. Negroid Head (MAN, No. 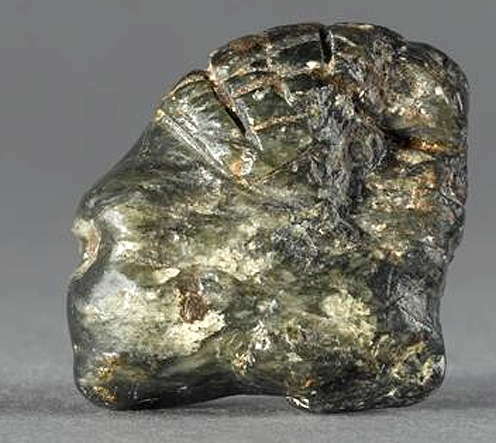 49284), in slightly fibrous green soapstone, has the same origin as the undescribed figurine. 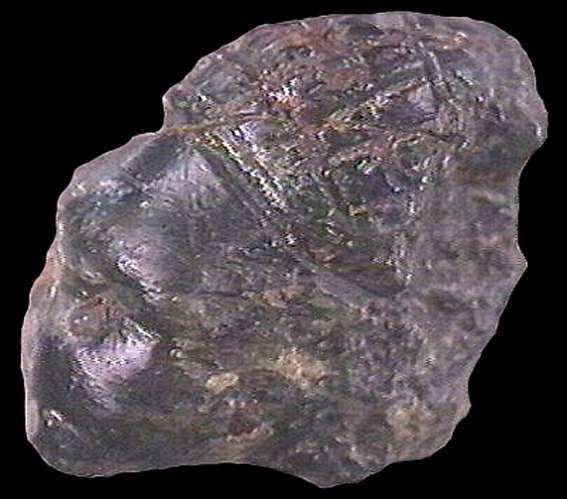 The surface is polished and worn, especially the face, the top of the head was broken into two pieces, only one of which has been glued back. 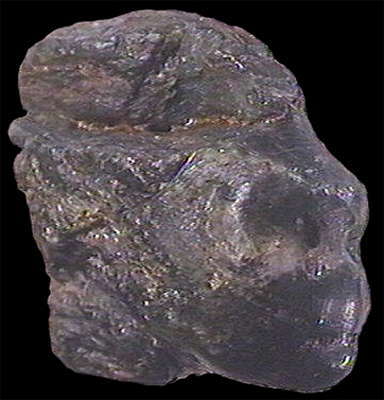 The base is polished and worn, which suggests that the object was already an isolated head in the Paleolithic. The piece measures 24 mm in height, 24.5 mm front to back and 15 mm maximum width, and is therefore relatively flat and has a protruding chignon of hair. The facial features are strikingly represented: there is a receding forehead with massive eyebrows and deep eye sockets. 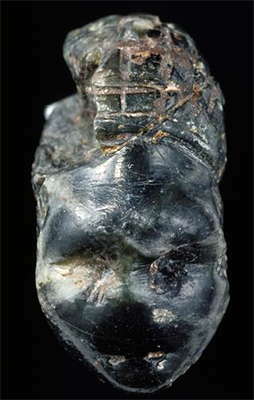 The nose is not present, it may be worn away, but most likely its depiction was prohibited by the shape of the piece of stone used. The cheekbones are strong, and the mouth is rendered by two small horizontal incisions aligned at the bottom of a depression, limited by a weak but clearly marked chin. The coiffure, largely destroyed, is represented by a grid reminiscent of the Venus of Brassempouy and that of the Femme à la tête quadrillée, from Laussel. (see below). The coiffure is represented by a series of incisions starting at the forehead, over the "bun" or chignon and back down onto the neck, cut by transverse incisions, the first of which form a kind of band above the forehead. As for the Dame de Brassempouy, Piette has sought rapprochement with the hair of Egyptian pharaohs and tried to make this head evidence for the existence of a Grimaldi Negroid population. 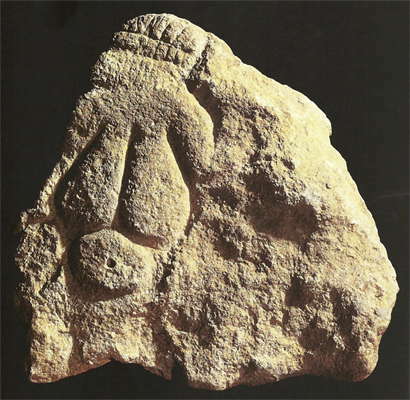 Femme à la tête quadrillée, from Laussel.